The MST1R (RON) kinase is overexpressed in >80% of human pancreatic cancers, but its role in pancreatic carcinogenesis is unknown. In this study, we examined the relevance of Mst1r kinase to Kras driven pancreatic carcinogenesis using genetically engineered mouse models. In the setting of mutant Kras, Mst1r overexpression increased acinar-ductal metaplasia (ADM), accelerated the progression of pancreatic intraepithelial neoplasia (PanIN), and resulted in the accumulation of (mannose receptor C type 1) MRC1+, (arginase 1) Arg+ macrophages in the tumor microenvironment. Conversely, absence of a functional Mst1r kinase slowed PanIN initiation, resulted in smaller tumors, prolonged survival and a reduced tumor-associated macrophage content. 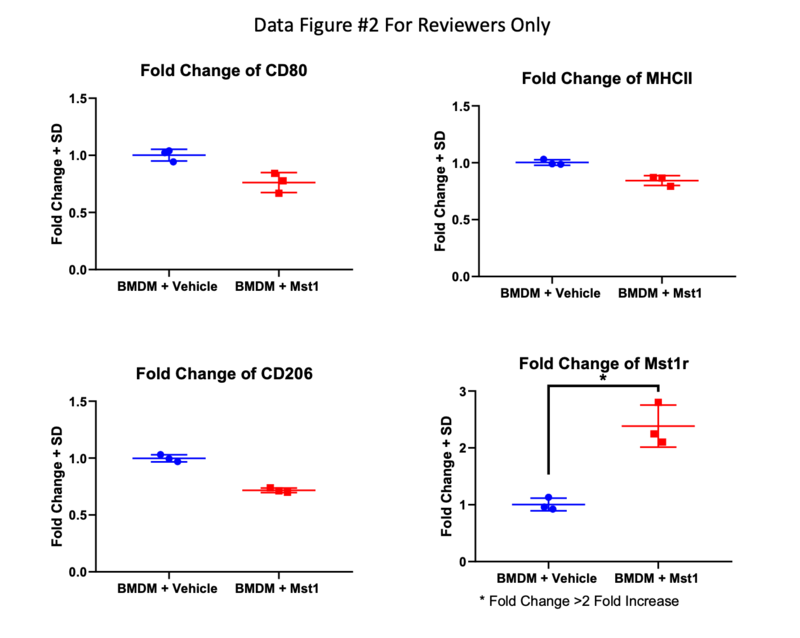 Mst1r expression was associated with increased production of its ligand Mst1, and in orthotopic models, suppression of Mst1 expression resulted in reduced tumor size, changes in macrophage polarization and enhanced T cell infiltration. This study demonstrates the functional significance of Mst1r during pancreatic cancer initiation and progression. Further, it provides proof of concept that targeting Mst1r can modulate pancreatic cancer growth and the microenvironment. This study provides further rationale for targeting Mst1r as a therapeutic strategy. Aguirre AJ, Bardeesy N, Sinha M, Lopez L, Tuveson DA, Horner J, et al. Activated Kras and Ink4a/Arf deficiency cooperate to produce metastatic pancreatic ductal adenocarcinoma. Genes Dev. 2003;17:3112–26. Hingorani SR, Petricoin EF, Maitra A, Rajapakse V, King C, Jacobetz MA, et al. Preinvasive and invasive ductal pancreatic cancer and its early detection in the mouse. Cancer Cell. 2003;4:437–50. Logan-Collins J, Thomas RM, Yu P, Jaquish D, Mose E, French R, et al. Silencing of Mst1r receptor signaling promotes apoptosis and gemcitabine sensitivity in pancreatic cancers. Cancer Res. 2010;70:1130–40. Singh A, Greninger P, Rhodes D, Koopman L, Violette S, Bardeesy N, et al. A gene expression signature associated with “K-Ras addiction” reveals regulators of EMT and tumor cell survival. Cancer Cell. 2009;15:489–500. Sharda DR, Yu S, Ray M, Squadrito ML, De Palma M, Wynn TA, et al. Regulation of macrophage arginase expression and tumor growth by the Ron receptor tyrosine kinase. J Immunol. 2011;187:2181–92. Mazur PK, Gruner BM, Nakhai H, Sipos B, Zimber-Strobl U, Strobl LJ, et al. Identification of epidermal Pdx1 expression discloses different roles of Notch1 and Notch2 in murine Kras(G12D)-induced skin carcinogenesis in vivo. PLoS ONE. 2010;5:e13578. Thomas RM, Toney K, Fenoglio-Preiser C, Revelo-Penafiel MP, Hingorani SR, Tuveson DA, et al. The Mst1r receptor tyrosine kinase mediates oncogenic phenotypes in pancreatic cancer cells and is increasingly expressed during pancreatic cancer progression. Cancer Res. 2007;67:6075–82. Waltz SE, Eaton L, Toney-Earley K, Hess KA, Peace BE, Ihlendorf JR, et al. Ron-mediated cytoplasmic signaling is dispensable for viability but is required to limit inflammatory responses. J. Clin. Invest. J Clin Invest. 2001;108:567–76. Correll PH, Morrison AC, Lutz MA. Receptor tyrosine kinases and the regulation of macrophage activation. J Leukoc Biol. 2004;75:731–7. Liu QP, Fuit K, Ward J, Correll PH. Negative regulation of macrophage activation in response to IFN-gamma and lipopolysaccharide by the STK/RON receptor tyrosine kinase. J Immunology. 1999;163:6606–13. Baumgarth N, Roederer M. A practical approach to multicolor flow cytometry for immunophenotyping. J Immunol Methods. 2000;243:77–97. Mosser DM. The many faces of macrophage activation. J Leukoc Biol. 2003;73:209–12. Pylayeva-Gupta Y, Lee KE, Hajdu CH, Miller G, Bar-Sagi D. Oncogenic Kras-induced GM-CSF production promotes the development of pancreatic neoplasia. Cancer Cell. 2012;21:836–47. Bayne LJ, Beatty GL, Jhala N, Clark CE, Rhim AD, Stanger BZ, et al. Tumor-derived granulocyte-macrophage colony-stimulating factor regulates myeloid inflammation and T cell immunity in pancreatic cancer. Cancer Cell. 2012;21:822–35. Tseng WW, Winer D, Kenkel JA, Choi O, Shain AH, Pollack JR, et al. Development of an orthotopic model of invasive pancreatic cancer in an immunocompetent murine host. Clin Cancer Res. 2010;16:3684–95. Schmid MC, Varner JA. Myeloid cells in the tumor microenvironment: modulation of tumor angiogenesis and tumor inflammation. J Oncol. 2010;2010:201026. Monti P, Leone BE, Marchesi F, Balzano G, Zerbi A, Scaltrini F, et al. The CC chemokine MCP-1/CCL2 in pancreatic cancer progression: regulation of expression and potential mechanisms of antimalignant activity. Cancer Res. 2003;63:7451–61. Sanford DE, Belt BA, Panni RZ, Mayer A, Deshpande AD, Carpenter D, et al. Inflammatory monocyte mobilization decreases patient survival in pancreatic cancer: a role for targeting the CCL2/CCR2 axis. Clin Cancer Res. 2013;19:3404–15. Tactacan CM, Chang DK, Cowley MJ, Humphrey ES, Wu J, Gill AJ, et al. Mst1r is not a prognostic marker for resectable pancreatic cancer. BMC Cancer. 2012;12:395. Zinser GM, Leonis MA, Toney K, Pathrose P, Thobe M, Kader SA, et al. Mammary-specific Ron receptor overexpression induces highly metastatic mammary tumors associated with beta-catenin activation. Cancer Res. 2006;66:11967–74. Gurusamy D, Gray JK, Pathrose P, Kulkarni RM, Finkleman FD, Waltz SE. Myeloid-specific expression of Ron receptor kinase promotes prostate tumor growth. Cancer Res. 2013;73:1752–63. Eyob H, Ekiz HA, Welm AL. Mst1r promotes the metastatic spread of breast carcinomas by subverting antitumor immune responses. Oncoimmunology. 2013;2:e25670. Thobe MN, Gurusamy D, Pathrose P, Waltz SE. The Ron receptor tyrosine kinase positively regulates angiogenic chemokine production in prostate cancer cells. Oncogene. 2010;29:214–26. Benight NM, Wagh PK, Zinser GM, Peace BE, Stuart WD, Vasiliauskas J, et al. HGFL supports mammary tumorigenesis by enhancing tumor cell intrinsic survival and influencing macrophage and T-cell responses. Oncotarget. 2015;6:17445–61. Vasiliauskas J, Nashu MA, Pathrose P, Starnes SL, Waltz SE. Hepatocyte growth factor-like protein is required for prostate tumor growth in the TRAMP mouse model. Oncotarget. 2014;5:5547–58. Colegio OR, Chu NQ, Szabo AL, Chu T, Rhebergen AM, Jairam V. Functional polarization of tumour-associated macrophages by tumour-derived lactic acid. Nature. 2014;513:559–63. Bronte V, Zanovello P. Regulation of immune responses by L-arginine metabolism. 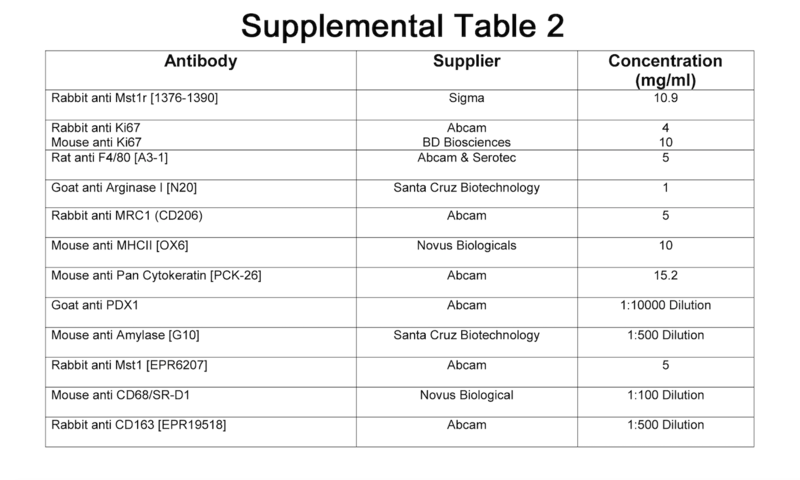 Nat Rev Immunol. 2005;5:641–54. Zhu Y, Herndon JM, Sojka DK, Kim KW, Knolhoff BL, Zuo C, et al. Tissue-resident macrophages in pancreatic ductal adenocarcinoma originate from embryonic hematopoiesis and promote tumor progression. Immunity. 2017;47:323–38. Gardner CR, Hankey P, Mishin V, Yu S, Laskin JD, Laskin DL. Regulation of alternative macrophage activation in the liver following acetaminophen intoxication by stem cell-derived tyrosine kinase. Toxicol Appl Pharmacol. 2012;262:139–48. This work was supported by NIH CA155620 (AML), NIH T32CA121938 (MLB), Ride the Point (AML) and generous gifts to the Sally Ride Fund for Pancreatic Cancer Research (AML) and the Cure Pancreatic Cancer Fund (AML). Study concept and design: MLB, SEW, and AML. Acquisition of data: MLB, BC, MMH, AC, ESM, DVJ, RPF, HA, MCS, PF, JM, PJH, ZJW, C-MT, NV, and JKS). Analysis and interpretation of data: MLB, BC, AC, and AML. Drafting of the manuscript: MLB, and AML. Critical revision of the manuscript for important intellectual content: MLB, DVJ, JAV, SEW, and AML. Statistical analysis: AC, DVJ, KM, and AML. Obtained funding: AML. Administrative, technical, or material support: AC, BC, ESM, DVJ, RPF, HA, MCS, PF, JM, PJH, ZJW, C-MT, NV, JKS, SEW, and JAV. Study supervision: AML. Correspondence to Andrew M. Lowy.